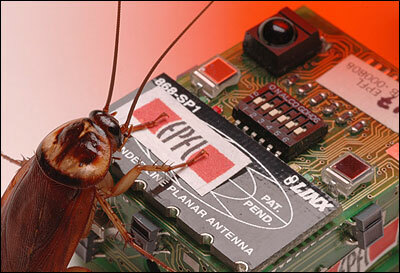 Robots Infiltrate, Influence Cockroach Groups To explore how cockroaches make group decisions, scientists created a robot that smells like a cockroach and follows some basic roach rules. And what they found is that just a few individuals can dramatically alter the behavior of the whole group. European researchers coated boxy robots with a cockroach smell so that real roaches would accept them as one of their own. Cockroaches generally prefer resting under dark shelters, but robots that liked brighter shelters could change the group choice. To explore how groups of cockroaches make collective decisions, scientists have created a robotic cockroach that the real insects accept as one of their own. The robot doesn't look anything like a cockroach to human eyes. "It looks like an electronic matchbox," said Jose Halloy, a researcher at the Universite Libre de Bruxelles in Belgium. But that doesn't matter, he says, "because in fact it has to look like a cockroach from a cockroach perspective." Basically, it has to smell like a cockroach. The scientists coat the boxy robots with a chemical, a cockroach smell, so the real roaches won't run away. "The cockroaches are not at all stressed by the robots because they are perceived as cockroaches," Halloy said. "So the cockroach is just accepting that kind of strange buddy. And that's the start of the game." The game was to see if researchers could use this robot to figure out how roaches make group decisions. "Cockroaches are gregarious insects, so they live in groups," Halloy said. They don't live in complex societies like bees or ants, he said, but roaches do make choices. For example, they like to rest together. When scientists put cockroaches in a habitat that has two identical little shelters — shadowed places where they can hang out — the roaches will "all gather together in the same shadow, below the same shelter," Halloy said. "So there is a mechanism that makes the system choose one of the shelters." Halloy and his colleagues suspected that a group decision emerges because every individual follows these simple rules: Wander around randomly, but spend more time in a place if you sense that it is (A) dark and (B) has other cockroaches. So the researchers made sure their robotic cockroach could follow those rules. 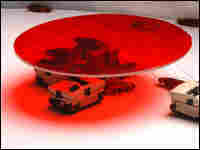 The robots had wheels, plus a light sensor and an infrared sensor to detect nearby roaches. 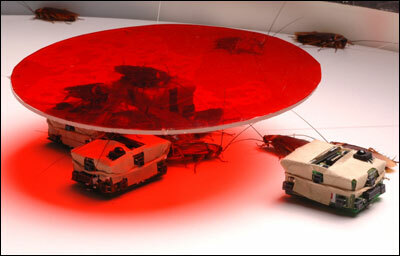 When they put these robots in with the living roaches, they all began to interact. Before long, the robots and cockroaches were huddled together under the same roof. "The robots and the cockroaches behave as a group," Halloy said. So then the scientists decided to reprogram the robots and change one of their rules. "We change their preference for darkness," Halloy said. "We make the robots prefer lighter places than darker ones." And they presented the group of robots and roaches with two shelters. One was dark, and one was light. What the scientists found was that the whole group would generally end up resting in the brighter place, even though normally roaches would prefer a darker one. The experiment, published in the journal Science, showed that just a few individuals can dramatically alter the behavior of the whole group. 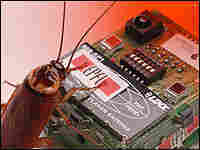 For people whose main interest in cockroaches is trying to kill them, Halloy cautioned that he can't foresee a day when robot roaches lure your kitchen pests into a trap. "The robot technology is very, very, very low compared to what the insects can do," he said, explaining that the robots can't climb up walls or wander through pipes. Still, even if it's not good pest control, other researchers say it's great science. Couzin said in computer simulations, simple rules for individual behavior can produce virtual schools of fish or flocks of birds that seem to closely mimic the behavior of real animals. But how do you know these made-up rules are really the ones that animals use? "There is a danger in that, you know, you create these rules and you get what appears to be the right phenomena, but there's no real way of testing that," Couzin said. He thinks interactive robots could let scientists do those kinds of tests. Cousin wants to someday build a robot that would swim with the fishes. And Jose Halloy said he would like to branch out from his work on cockroaches. His next goal? A robot chicken.